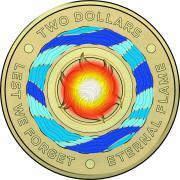 The two dollar coin was first introduced on 20 June 1988. Planning for a two dollar coin commenced around the same time as that for the one dollar coin. Like the one dollar, the two dollar coin replaced the note of the same denomination which had a short service life through high use. 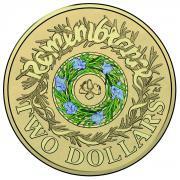 The image on the Australian two dollar coin represents an archetype of an Aboriginal tribal elder, designed by Horst Hahne. 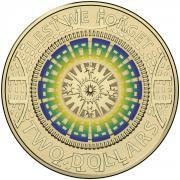 Numerous designers were invited to contribute designs for the two dollar coin based on a brief to include a representation of the head and shoulders of an Aboriginal Australian, the Southern Cross and Australian flora. The selected design was inspired by an artwork by Ainslie Roberts and modified in line with coin production requirements. Roberts used some features of Gwoya Tjungurrayi, otherwise known as One Pound Jimmy, as inspiration when creating a portrait depicting a traditional Aboriginal tribal elder. The rest of the features were derived from Roberts’ imagination and visual memory developed after drawing thousands of images of Indigenous people. 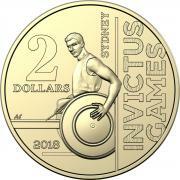 The size of the two dollar was determined after consideration of the needs of the visually impaired community, security considerations, a desire to avoid shaped coins, practical limitations to the diameter and thickness of coins, and to allow for future expansion of Australia's circulating coin array. When introduced, it was necessary to accommodate this new coin with seven existing denominations. This denomination has since been used for commemorative designs. Designed by Horst Hahne. The 1988 and 1989 dated coins carried the designer’s initials. Designed by Horst Hahne. The designer’s initials were removed from the coins from 1990 onwards. No two dollar coins were produced in 1991. Commemorating Remembrance Day with an image of a poppy. Designed by Aaron Baggio. Commemorating Remembrance Day with an image of a red poppy. Designed by Aaron Baggio. Commemorating the 60th anniversary of the Coronation of Her Majesty Queen Elizabeth II with concentric purple stripes and a central design feature of St Edward’s Crown. Designed by Aleksandra Stokic. Commemorating Remembrance Day with a dove and olive branch surrounded by concentric green stripes and rays of sunlight inspired by the original Rising Sun badge of the Australian Commonwealth Military Forces. Designed by Royal Australian Mint. Commemorating 100 years since the Anzac Cove landings, inspired by the poppy, the distinctive and powerful red coloured print encapsulates the solemn words ‘Lest We Forget’. Designed by Aleksandra Stokic. Commemorating In Flanders Fields sculpted larks surround orange coloured rings representing the sunset glow. Designed by Royal Australian Mint. An artistic depiction of Napier Waller’s mosaic from the Australian War Memorial’s Hall of Memory. 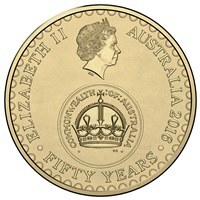 Designed by Royal Australian Mint. The distinctive pointed leaves and purple flowers of the herb rosemary make a moving and evocative design. 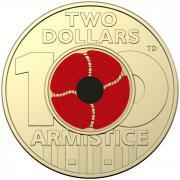 Designed by the Royal Australian Mint. A striking and evocative design that is inspired by the Eternal Flame at the Australian War Memorial. Designed by the Royal Australian Mint. 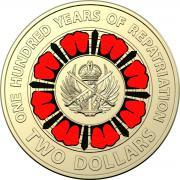 This 2019 $2 coloured coin commemorates a century of repatriation in Australia. Notes for using these tables: These are final mintages where the numbers have been published in an Annual Report and all coins have been issued. Items marked not available will be updated when they pass the Annual Report and issue test. ** Partial Numbers for 2018 - Total production to be confirmed, once the 2018-2019 Annual Report is released.